Yossi Milo Gallery is pleased to announce "Borderlands," an exhibition of recent color photographs by Eirik Johnson. The exhibition will open on Thursday, January 26, and close on Saturday, February 25, with a reception for the artist and book signing on Thursday, January 26 from 6:00 to 8:00 pm. This is Mr. Johnson's first solo exhibition in New York. Eirik Johnson's large color photographs concentrate on the strange, chance beauty that occurs where the fringes of the urban terrain intersect with the natural landscape. Johnson's scenes—formed when man-made structures, such as discarded objects or tire tracks, interact with natural elements such as tides, overgrowth, shafts of light and fire—appear to be carefully arranged but are, in fact, serendipitous. Johnson photographs remote "non-spaces" where people have left their trace on the landscape, whether by force or by accident. He draws attention to the bizarre and the banal as well as to the wearing effects of time, histories of place and the struggle/partnership with which humans and nature are engaged. By finding formal compositions, contrasting or monochromatic color palettes and impromptu sculptures in the environment, Johnson suggests that the border between man and nature is not absolute. 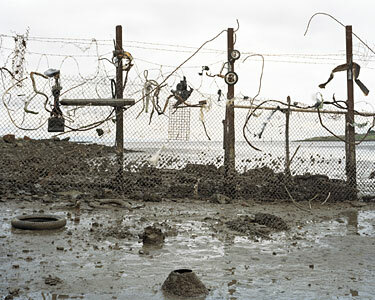 Eirik Johnson was the recipient of the 2005 Santa Fe Prize for Photography for "Borderlands," which was exhibited in Fall 2005 at the Museum of Contemporary Photography in Chicago. A book of the same title, with an essay by the museum's Director, Rod Slemmons, was published by Twin Palms Publishers in Fall 2005. Born in Seattle in 1974, Eirik Johnson currently lives and works in San Francisco. He holds an MFA in Photography from the San Francisco Art Institute and was awarded a William J. Fulbright Grant for study in Peru in 1999.